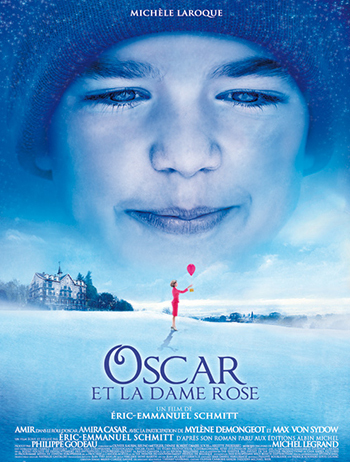 Synopsis: Listening in to a conversation between his doctor and parents, 10-year-old Oscar learns what nobody has the courage to tell him. He only has a few weeks to live. Furious, he refuses to speak to anyone except straight-talking Rose, the lady in pink he meets on the hospital stairs. As Christmas approaches, Rose uses her fantastical experiences as a professional wrestler, her imagination, wit and charm to allow Oscar to live life and love to the full, in the company of his friends Pop Corn, Einstein, Bacon and childhood sweetheart Peggy Blue.